Surprise! It is time to remodel! Every time I asked Jim when we were going to get started on the DIY bathroom remodel, he always replied with “Soon” or “Maybe next weekend.”. That went on for about a month. I was tired of waiting. I asked him one last time and got the same response. So, while he was at work on Friday, I went to the workshop and grabbed a sledgehammer and a wheelbarrow. I was glad to go into the bathroom swinging that hammer! I was a tile busting fool! It was very invigorating to tear all of that out. I tore out the paneling on the walls and every ounce of tile. Then I removed the toilet and the medicine cabinet. I could not move the yellow cast iron tub by myself. That had to wait for when my husband was here to help me. I left the vanity. It was in good shape. It was going to get a facelift too. The countertop even had tile on it. I threw the tile into the wheelbarrow as I worked to remove it. There was a ton of it to haul away. I wished I have counted how many wheelbarrow loads I hauled out of the house that day. The bathroom was cleaned up and ready for a change before Jim came home. The first thing Jim does every day when he comes home is to go to the bathroom. Let’s see if he notices the toilet missing! Ha! 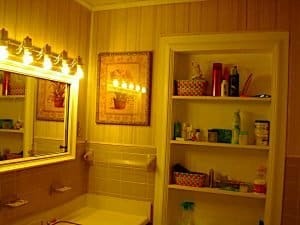 As you will notice in a few of the pictures, there use to be a window to the right (as seen above) when you walk in and one next to the left of the vanity. Both windows were “dummy” windows because there are rooms behind each one now from where my in-laws built onto the house through the years. Jim came home and laid his lunchbox on the counter and headed to the bathroom. It is time to unveil the destruction! He opened the door and was like “Did you do this all by yourself?”. I said, “Yes, I thought this weekend would be a great weekend to redo the bathroom.”. He agreed. What else could he say? We had no downstairs toilet. Ha! Off to Lowe’s to buy what we needed! I wish I had taken pictures of the end result of the demolition. I was on a mission and too dirty to touch a camera. The lighting was bad in the old bathroom, as you can see. I already had a vision in my head of what I wanted the bathroom to resemble. I knew that the colors I wanted were going to be black, white and gray. We were doing this on a strict budget because we had more rooms to renovate. We did not buy the cheapest materials, but we did not buy all top of the line either. I had done my homework and knew where we could get away with more inexpensive materials. 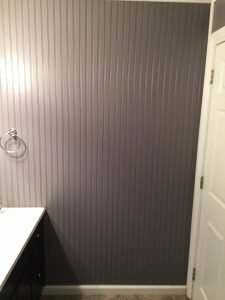 We replaced the old paneling with beadboard wall panel. The beadboard came already primed with a white basecoat. It still took two coats of gray to cover it. I love how the beadboard looks. It goes perfectly with our country farmhouse. It was very easy to cut and measure. 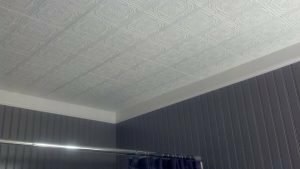 If the beadboard panels are too expensive for your budget, you can purchase the beadboard wallpaper. You can paint it. A small portion of our paneling had black mold on it. We were afraid to try to keep any of it or the flooring. Have you ever tried to pull up linoleum that has been glued down? Fun, right? Jim replaced our old light and fan in the center of the ceiling. 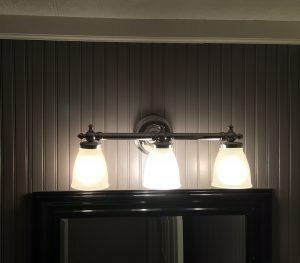 He also replaced the light over the vanity. Then we painted the ceiling and walls. He measured the molding, cut and then painted white. Jim attached the molding to the top of the walls against the ceiling. 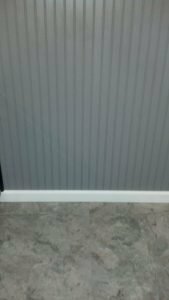 I caulked a line of caulk along where the ceiling and molding met. I used a damp paper towel to smooth over the caulk. The caulk filled all tiny gaps between the ceiling and molding. It was a nice finishing touch. Next up, the tub and surround. I love our new tub much better than the old ceramic/iron tub. Bath water stays warmer for longer, and it is not as slippery. 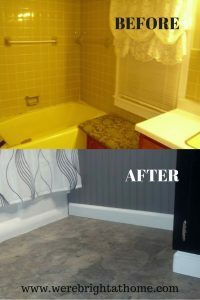 I caulked around the tub and the surround. I used the damp paper towel trick on this too. 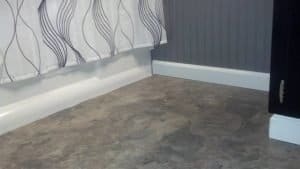 We used vinyl floor tiles to cover the floor. It looks like real stone. I have had people stoop down to touch it and ask if it was real. It is that nice. We used vinyl floor tiles in our kitchen and on the service porch because we like it that well. It cleans up nicely too. I did this project by myself while Jim was at work. The tiles we bought are peel and stick. All I had to do was find the center of the floor and make sure that I used different patterns side by side. It is important to plan out which way you want the tiles turned before you start sticking them to the floor. If you are not careful, you could end up with two of the same patterns together. Visitors may not notice, but it would drive me crazy knowing it was there. I am very picky. After you have the floor planned out, just peel and stick. To make sure all of the tiles hold firmly to the floor, I took a rolling pin and rolled it over the floor a few times. None of the tiles have come up or anything. It has lasted through many many hot showers. 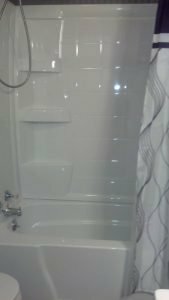 Jim installed the shower and bathtub faucet. 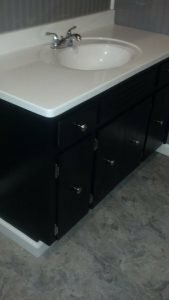 Then he installed the single sink vanity and faucet. He cut the bottom molding, painted and attached to the lower part of the wall. I did not caulk around that molding. 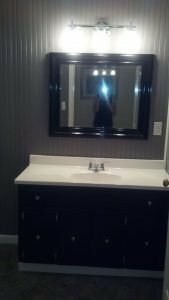 He hung the vanity mirror and got the toilet hooked up. I am in love with this remodel project! It is so modern and clean. I love it! Don’t forget to sign up to get your FREE copy of the complete supply list for this project!